Rev up the party fun with this super cool Blaze and the Monster Machines Pinata. 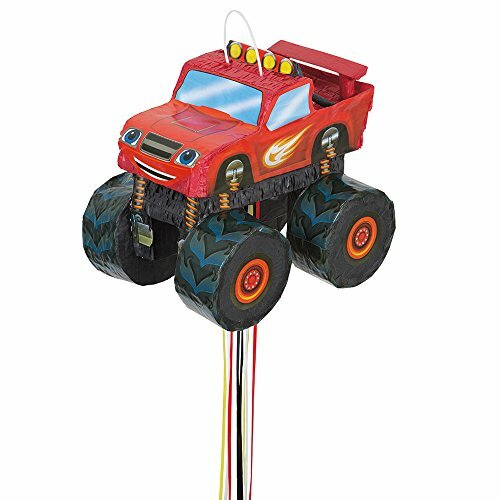 Shaped just like kids’ favorite bright red monster truck, this pull string pinata will make sure everyone has a blazing good time at any Blaze and the Monster Machines birthday party or other kids party. When it’s time to get the games in gear, just hang this pinata from the ceiling, or from a sturdy tree branch outside. Then, line up the little speedsters and have them take turns pulling on the 12 hanging strings to find the one that releases the goodies inside (sold separately). Even the youngest Axle City fans will be able to take part, as no whacking is required to send the candy raining down. Best of all, since this pinata won’t get broken open, it also doubles as an action-packed party decoration that the birthday boy can display in his room after the bash.